When the body fails, you've got two choices. Send a doctor in, or send a prayer up. You'll find Dr. Wolfgang Pike at his piano. Music has always been Wolfgang's refuge. It's betraying him now, as he struggles to compose a requiem for his late wife, but surely the right ending will come to him. Certainly it'll come more quickly than a cure for his patients up at Waverly Hills, the tuberculosis hospital, where nearly a body an hour leaves in a coffin. Wolfgang can't seem to save anyone these days, least of all himself. Sometimes we just need to know we're not the only ones in the fight. A former concert pianist checks in, triggering something deep inside Wolfgang, and spreading from patient to patient. Soon Wolfgang finds himself in the center of an orchestra that won't give up, with music that won't stop. 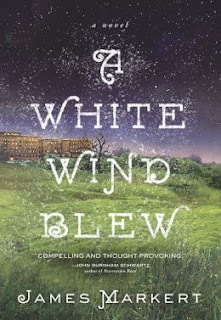 A White Wind Blew delivers a sweeping crescendo of hope in a time of despair, raising compelling questions about faith and confession, music and medicine,and the undying force of love. James Markert grew up in Louisville, KY, in the shadows of Waverly Hills, and was drawn in at an early age by Waverly's popularity as one of the most haunted places on earth. After visiting the building for the first time, he was quickly moved by the history of the massive gothic structure. It was there that the story of Father Wolfgang Pike began to form. 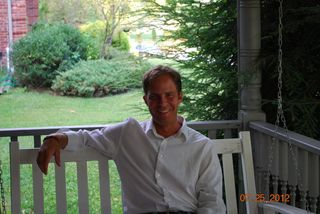 James has a history degree from the University of Louisville, and is a USPTA tennis professional. His comedy screenplay, 2nd Serve, was produced by Sundance award-winner Gill Holland and was due to premiere in fall 2012. THE BOOKISH DAME INTERVIEWS JAMES MARKERT! Welcome, Mr. Markert! I've been dying to interview you for my blog. I thought your book was fascinating, and want to ask several questions so we can get to know you better. Thanks for taking time to spend with us today. Here we go! Now that I’ve totally converted to a laptop, I can move around the house. I can write a screenplay from anywhere, but when working on a novel I’m best in the dining room. Hmm, no keepsakes or gimmicks, but I do have to have music playing all the time when I write. I’ve had several people tell me I write well, especially early on, but they were mostly relatives. So that doesn’t count, and they probably all weren’t telling the truth. But the person who said it and it had the biggest affect was my agent before he signed me. It gave me the confidence I needed to help make a career of this. Stephen King was the author who got me loving to read in high school, and then wanting to write. I admire George R.R. Martin for creating such a vast, detailed, amazing world like Westeros. My other favorite authors are Ken Follett, Pat Conroy, John Irving, Carlos Ruiz Zafron, Dennis Lehane, and Greg Iles. I’ve certainly read some classics, but I’m much more of a contemporary reader. But I always loved reading Bram Stoker’s Dracula. Edger Allen Poe for sure. Arthur Conan Doyle. Charles Dickens. As long as I could get back out of the book, I’d jump into Pillars of the Earth by Ken Follett, and I’d be Tom Builder. It would be cool to build a medieval cathedral. Julius Caesar. Abraham Lincoln. Cleopatra. Teddy Roosevelt. Helen of Troy. I’d probably have to have cornbeef and cabbage and some Guinness. Lake. No sharks. But, then again, the Lochness monster…so I’ll take a POOL. Yes, I’m 360 pages into my next book, The Strange Case of Isaac Crawley, and it will be similar in tone and scope to A White Wind Blew. It takes place in the late 1800s and instead of music and a tuberculosis sanatorium it involves the theatre scene and a lunatic asylum, as well as a love story, and Dr. Jekyll and Mr. Hyde, and a slew of sculptures. Quite a cast of characters I promise. I’m also working on a historical fiction series about ghosts, the arts, and art history. The first book is The Book of Jonah (I’ve already written draft one, Jonah is a painter who died in 1939). The second book is the Book of Julia (she makes mosaics in Pompeii, and died when Mount Vesuvius erupted). It’ll be a long series, and all the books will be linked. Nope, this about covered it, unless you want to know my favorite band...and that would be U2 or Pearl Jam. Absolutely "charming" answers. I think I'm in love with you as well as your up-coming book ideas. I can't wait to read them! "The Strange Case of Isaac Crawley" sounds great. Looking forward to all of them. In the early 1900's, Louisville led the country with the highest rate of tuberculosis (known as the "white plague"). The Waverly Hills Sanatorium opened in 1910 as a tuberculosis hospital, where the only cure was rest and fresh air. It is estimated that 60,000 people died inside Waverly's walls. The hospital closed in June 1961. The building has over 100,000 fans on Facebook, and has been popularized on national television on VH1, Syfy, Travel Channel, ABC Family and more. It is thought to be haunted. I postponed reading this book because I worried it might read like a bit of a text book. I was so mistaken! Like rich dark chocolate tempered with sea salt, "A White Wind Blew" is bittersweet and addictive. I kept coming back to the story, reluctant to leave it even when I knew I should be sleeping. James Markert is a little known author at this time, so it was a pleasure to find him. He's a grand author with a gift for storytelling. His characters are alive and real, causing us to engage with their struggles of disease, morality, love and living life in the face of fatality. Primary characters such as Father/Dr. Pike and Big Fifteen are strong and earnest, and Susannah is the consummate nurse in every respect. The patients of Waverly Hills sink into your heart. I loved the gruff McVain and his gangsterish antics. In fact, I was reluctant to leave the story and the characters as it closed in the end. While I found moments to be written in a plodding way such as one might expect in a first novel, as the action/plot progressed it was so absorbing that that small hitch was easily overlooked. With a bit more experience I expect Mr. Markert will be more than capable of maturing into the best of authors. I look forward to reading more from him in the future, and only mention this because it speaks to a new writer but not to the main quality of the book. Because of Markert's work, I'm very motivated to learn more about the mysterious Waverly Hills! Since the book is based on facts about the famous sanatorium, I found this part of it fascinating. The "cures" were interesting as part of the story. Some of them mentioned; like the lung surgeries, seemed archaic and frightening. The body chute was a little horrifying to think of. And the moving of the patients on and off the balconies into the icy air for breathing purposes seemed nearly cruel. I could just feel them freezing~feeling cold most of the time in the day and night air. Makert brings all the sanatorium conditions to life. I wondered if the "music cure" of the fictitious Dr. Pike was ever really used; if there was actually a choir and small orchestra at the sanatorium at any time. The whole scene and content of the novel was slightly eerie. When all is said and done, I believe this is a book that will be enjoyed by those who love haunting medical stories and those who relish books set close to our country's heartland. It's moving and real as the people you meet every day. Poignant and mysterious, a love story and a story of triumph, this is one that I won't soon forget. It had moments that reminded me a lot of "Cider House Rules." Thank you for this post. I have never heard of this epidemic or the place before. I watched the video, it is so eerie. Put this book on my wishlist.